The Italian Sculptor Alessandro Pavone visited Bergen last autumn where he both made and exhibited several works. 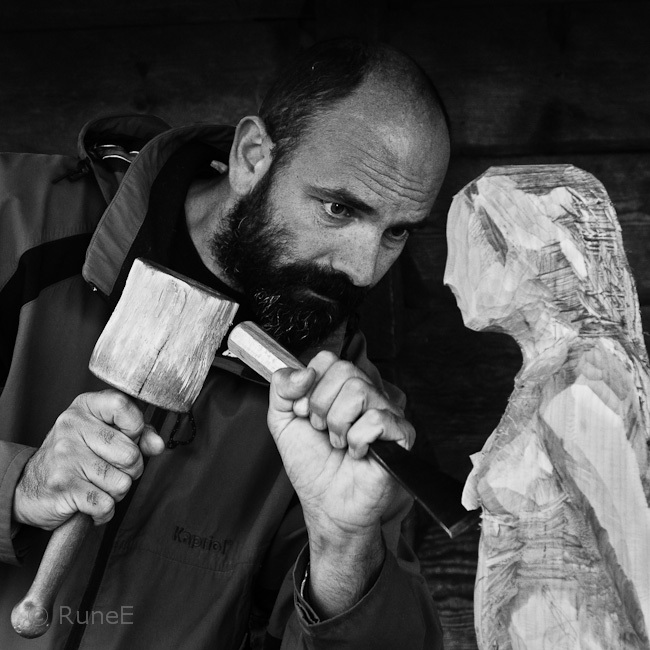 Here he is making a small wooden statue of St. Sunniva, the patron saint of Bergen. It was a pleasure to see such a fine artist at work and I shot several photos of him - with his permission, of course. Here is one of them. PS Have a nice weekend everyone! I am fascinated by people with such incredible talent as his! What a terrific capture, Rune, and what wonderful memories you must have! Hope you have a great weekend! I like this hands, I like the way he is looking at the statue, I like the way he gives birth to the silouhette. I LOVE this portrait, very beautyful, and even stronger in B&W. Have a nice week-end, dear RuneE! You have captured his intensity so well!! I imagine it was quite interesting to to watch him work. I imagine he loves this photo. It shows great talent - in more than one way. Beautiful photograph. Oh my, this photograph is a work of art in itself! Such intensity! I'm sure the sculptor is grateful. Det her RuneE var eit knakandes godt bilde!! The effects of your photography make the sculptor himself look sculpted. Nice job, Rune! Ønsker deg en flott fredda' kveld! You can see his concentration in his eyes. Great shot. Prospero is right, you captured his artistic concentration very well. Fantastisk!!!! ett portrett Rune, du har fanget hans intensitet, hans fasinasjon for kunsten og DET tror jeg faktisk kan være litt vanskelig. The photo doesn't show up on my Chrome browser. Chrome has lots of problems like this but I use it sometimes. So to see the man at work, I used Firefox and it works fine. Nice photo and I like the black and white. Oyy, så flott dette var Rune ! Et virkelig godt portrett :0) Det gjorde seg også veldig godt i svart/hvitt da detaljene kommer så godt frem synes jeg. (når det gjelder kommentaren hos meg, Bleiksøya er langs kysten av Andøya i Vesterålen - ikke så rart at du ikke visste det - jeg visste heller ikke før jeg har vært å fartet i området - ....må dit flere ganger for der var det flott ;0))) Ha en flott dag i vinterkulda - hører det snør så mye vestpå :0) ! An artist's eye deliver it all. Utrolig bra, Rune. Føler nesten jeg er tilstede. Blikket til kunstneren, lyset, her stemmer alt! Dessuten syns jeg sort/hvitt fremhever motivet! BRAVO! .... og det gjør ingenting om vi får se flere bilder fra denne serien! What a fabulous b&w portrait - it's beautiful. I love seeing the concentration on his face as he works. What a brilliant portrait, RuneE, and how you have captured his intense creativity as he works! Beautiful capture Rune, would like to see more sometime. Hope you are keeping well my friend. Tis truly a joy to watch an excellent artist at work. The artist is looking intently into the face of the statue as if looking for the spirit to reveal herself. Nydeleg bilde! Du har fanga hans entusiasmen og konsentrasjonen for arbeidet hans, godt gjort!! What a fine portrait of this artist and his work. I wish a nice week - and hope you are all right now after your operation? You've got it all there, RuneE--the nature of the work, the tools, and the intensity of the worker. I wonder if this could be the image to represent the nature of all artistic work. Hi Rune! This is a very impressive photo of a very impressive sculptor or maybe I should say :"woodcutter"! Thank you so much for the congratulations. Have a great week. Has Alessandro Pavone seen this stunning photo of yours? It is so dramatic in black and white. I am sure he would love a copy- it is a work of art in itself! Congratulations on a fine photo. Oh Rune, this is just a fabulous photo. I don't know much about photography, but if I did, I would surely have to give this one an A+. The detail is amazing. You have captured the intensity in his face as he is working. I wish we could see the other ones you took of him, but this just must be the best one! I do hope too, that you are completely well now and feeling great. beautiful portrait! these artists are fascinating people! quel regard,quel attention ! Magnifique photo,bravo ! I love how you've captured the eyes of the carver looking at his work! Very nice in monochrome! Great capture and great use of monochrome!